The New Mexico green chile plant is a warm season vegetable. 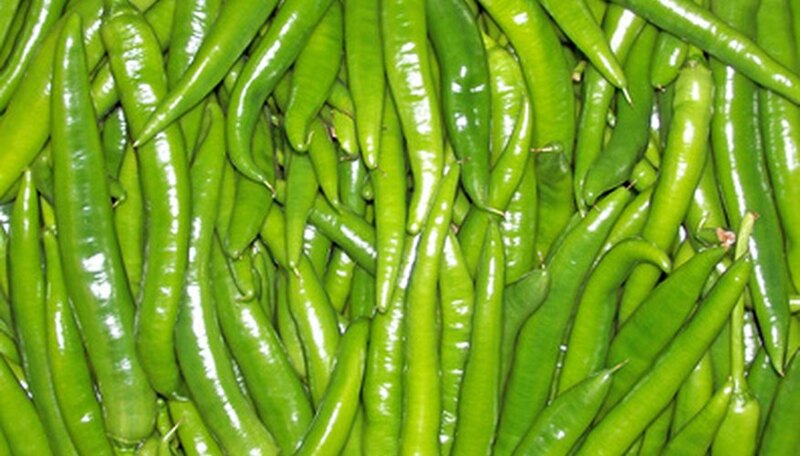 It is used either immature and green as a mild pepper or it is left on the plant until it turns red and fully mature. Green chiles are often roasted before being used, adding the signature smoky flavor they are prized for throughout the southwest. Green chiles take up to four months before the first harvest and they will not survive in temperatures below 60 degrees Fahrenheit. If your growing season is too short for the plants, try starting the seeds indoors up to two months before you transplant them outside. Fill individual seed pots with a moist seed-starting mix. Fill the pots to within a half inch of the rim. Sow one to two green chile seeds per pot. Plant them at a ¼-inch depth then lightly moisten the soil surface. Cover with a plastic bag and place in a warm, 75 degree Fahrenheit room to germinate. Remove the plastic bag once sprouts appear and place the pot in a warm room where the pepper receives at least eight hours of direct sun a day. Alternately, place the seedlings under grow lights for 14 to 16 hours a day. Transplant the green chile plant outside once soil temperatures are above 60 degrees Fahrenheit and after all frost danger has passed. Prepare to transplant by setting the plants outside in a protected area for a few hours every day for up to a week before transplanting. Plant the green chiles in a full-sun, well-drained garden bed. Plant them at the same depth at which they are growing in their nursery pots, and space them 24 inches apart in all directions. Provide at least two inches of water to the plants weekly, or water often enough that soil remains moist but not soggy. Varieties of New Mexico green chile include NuMex Big Jim and NuMex Conquistador. If the seed variety has NuMex in the cultivar name you can be assured it is an authentic New Mexico green chile. Always follow the seed packet directions for fertilization and other care, as this is specific to the particular green chile cultivar. Avoid planting green chiles in the same bed two years in a row, as this leaves them prone to disease. Rotate your garden bed yearly.